We have disused the part1 of this article in my previous post so this is simply continuation of the part one, the reason is just to shorten the lengthy stories. So here in Part 2 we will be completing the set by taking the following steps. From where we stopped the next thing we will do now is to configure the MikroTik User Manager Radius Server. So I will encourage you to spend some time to study the article once it comes up. In this section, I will go straight to the configurations, and then I will be doing Radius Server for Hotspot user authentication, authorization and accounting configurations. So then we login into our router using the winbox and then Login to User Manager Radius Server web interface with customer or subscriber credentials using http://radius-server-ip-address/userman (for this configuration: http://192.168.110.10/userman) URL. Click on Routers button from left button panel and then click on Add > New menu item from top menu bar. Router Details window will appear now. In Main panel, put a meaningful name for your client router in Name input field. Also choose owner from Owner dropdown menu. Put your client router IP address in IP address input field. Now put shared secret password that you have provided at Radius client configuration in MikroTik RouterOS Shared secret input field. In Radius incoming panel, click on CoA support check box and put 1700 in CoA port input box. Click on Add button to add this router in Radius Server Router list. Login to User Manager Radius Server web interface with customer or subscriber credentials using http://radius-server-ip-address/userman URL. Put your client router IP address (RouterOS IP: 192.168.110.2) in IP address input field. Click on Add > New menu item from top menu bar. Limitation details window will appear now. In Main panel, put your package name what you want in Name input field. As I am creating my first 512MB package, I am providing 512MB Package in name field. Also choose owner from Owner dropdown menu. In limits panel, put 512M in Transfer input field. We don’t want to apply any download and upload limit. If total download and upload exceeds 512MB, the user will not be able to connect more. We don’t also apply any bandwidth limitation because it is valueless to apply bandwidth limitation in Data Limit package. In Constraints panel, put IP Pool name that you will find at IP > Pool window in your NAS RouterOS. Click Save button to save this limitation package. Similarly, create 1GB Package. Just put 1G in Transfer input filed and put this package name as your wish. Now click on Profiles tab and click on PLUS SIGN (+). Create profile window will appear. Put profile name what you want in Name input field. For my configuration, I am providing 512MB as name. Click on Create Similarly, create 1GB profile. From Profiles dropdown menu, select 512MB and put 1w in Validity input box. Choose package starting time At first logon from Starts dropdown menu. Put price of this package in Price input box and keep Shared users value 1 so that only one user can login at a time with a username and password. Click Save profile button to save your information. At the bottom of this profile, you will find Unlimited profile that mean there is no limitation for this profile. So, click Add new limitation Profile part window will appear now. You will find your limitation packages that you have created in Limits Click 512MB Package checkbox and the click Add button to add this limitation for this profile. Again select 1GB from Profiles dropdown menu and 4w2d in Validity input box. Choose package starting time At first logon from Starts dropdown menu. Put price of this package in Price input box and keep Shared users value 1 so that only one user can login at a time with a username and password. Click Save profile to save this information. Now click Add new limitation button and click 1GB Package checkbox from Limits panel and then click Add button to add this limitation. We have created two Data Limit packages in our profile configuration. Similarly you can create as many Limitation packages as you want following the above steps properly. In the next section, we will create Voucher or Scratch card Template in our Radius Server. Now we are going to create scratch card template so that after creating users we can print scratch card according to this template. The following steps will show how to create scratch card or voucher template in User Manager Radius Server. Now choose Vouchers from Name dropdown menu. In Header textarea, put below HTML and CSS code. In Row textarea, put below HTML and CSS code. Click Save button to save this voucher template. You can change this card design if you have a little HTML and CSS idea. If you need to change only card text, just change texts in Row textarea according to your requirement. The following steps will show how to add random users in your User Manager Radius Server. Click on Users button from left button panel. Now click on Add > Batch menu item from top menu bar. User details window will appear. In Main panel, choose owner from Owner dropdown menu and provide number of users you want to create at a time. You can also provide username prefix as well as username and password length in this panel. Now click on all the users checkbox for whom you want to create scratch card. Click on Generate menu and then choose Vouchers Vouchers window will appear. Now click on Generate button and you will find your entire scratch cards in a HTML page like below image. Now sell these cards to your nearest shop and get auto revenue monthly or your desired time period. Hotspot Server is now ready to authenticate users via User Manager Radius Server. Now it is time to test our Hotspot server. For this, connect any IP device to your network. After connecting, a dynamic IP will be assigned to your device from DHCP server that was created while installing Hotspot server. 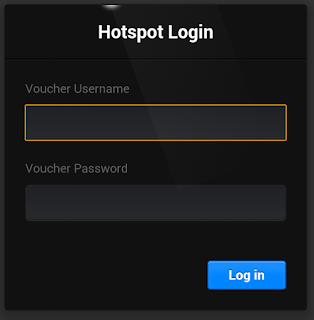 Usually, Hotspot uses DHCP server to assign IP address and other related information that are necessary to get login page. Now open any web browser and try to visit any web page. You can see the login page of your Hotspot server. If you do not get login page for any cause, type your DNS name that was provided while installing Hotspot server. 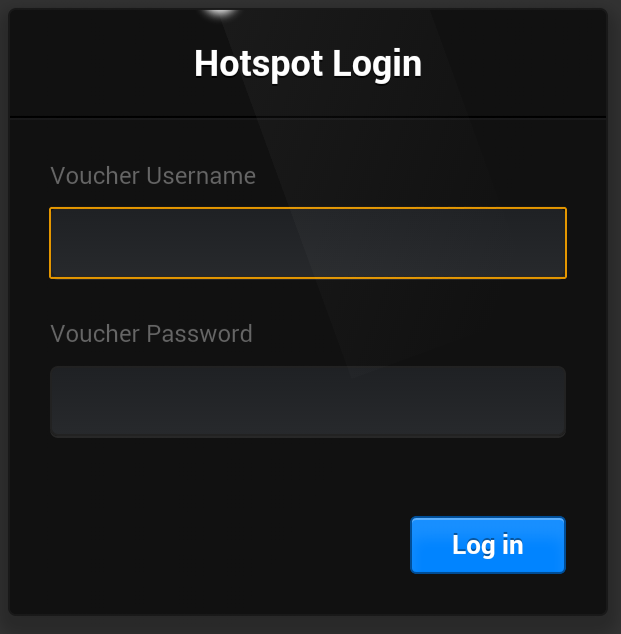 Now you can see your Hotspot login page like below image. Radius Server offers a user page where user can login their profile page and can show their account status as well as can change their account information and password. The following steps will show how to access this user page in your Radius Server. Type http://radius_server_ip_address/user to get user login page if you have only one subscriber or customer in your Radius Server. But if you have more than one customer or subscribe, you have to type http://radius_server_ip_address/user/public_id where public_id is Public ID of the customer or subscriber. This Public ID must provide when customer or subscriber is created. Type username and password of your desired user in Login and Password input field and then hit login button. Now user can show his account status, profile, sessions and payment option from this page. Also he can change his password from Settings menu. If you follow carefully the above tutorial, you can easily create a data limitation and prepaid billing system network with MikroTik Hotspot and User Manager Radius Server. However, if you face any challenge doing the above leave a comment on the box and we will help you out. ← How to properly Configure Mikrotik Hotspot with Data Limit and Prepaid Billing System Part1.